The G1 event has come and gone and it looks like we’re seeing an epic paradigm shift in the mobile space. iPhone started the ball rolling and Android is about the finish the job. The change? Phones are now officially computers and the expectation for most users is that they behave in the same way a powerful laptop or desktop PC would perform, albeit in a considerably more compact package. I was struck by something during the G1 presentation today and it took me a quite a while to figure out what it was. Back in 1997-98 while I was at Carnegie Mellon we were at a crossroads in IT. The web was taking off in a general way and email was king for college students. The school was full of computer clusters – some Mac, some PC, and some greenscreen Unix dumb terminals in the library running X Windows. While the Macs and PCs were easy to understand and run, you could just tell that the Unix machines were like an iceberg – 98% of the power is under water, unseen by the average user. Putting the G1 through its paces showed a intense attention to detail on the part of Google and a tacit promise from the phone that it was far more powerful than originally described. This is G1’s blessing and curse. T-Mobile will have a hard time selling Android phones. 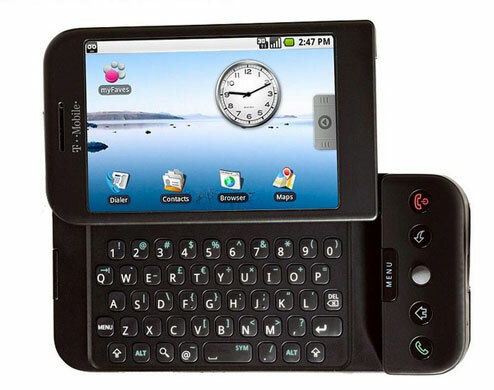 Unlike Windows Mobile, with it’s loosey goosey promise of Windows compatibility or the endless feature lists of some of the more basic phones, the G1 offers a platform for multiple amazing things, all arrayed to the user in a non-trivial way. Unless the company pulls back and begins describing the G1 in Mac/PC terms – where Mac is not compared to the PC but is instead the PC experience magnified – they will lose people who eye Google with trepidation or are worried about compatibility with their existing mail and desktop systems. “I’ve been using this phone, well, for a while now,” said Page. He’d even taken it home and written an application for it that, using the accelerometer, would measure how long a tossed phone would remain in the air. That one of the heads of Google still goes home at night and tinkers with code speaks volumes about the culture from which Android is born. Android is what that X terminal was to me back in the day and what Linux is to us all right now – a strong platform on which to build. If it becomes popular, Google will essentially connect all of us to their giant grid and control all of our inputs and outputs. If it fails it will encourage a new group of geeks to take it and build upon it, turning Android into something like BSD to Apple’s OS X. Either way, it’s a win win for the programmer and the geek and, in a way, the average consumer. Now, however, the only trick is to convince casual smartphone users that this – and not anything Redmond or RIM has to offer – is what they want.